RG3 knee injury: What a shock--the Redskins let their star quarterback play through a wounded knee. 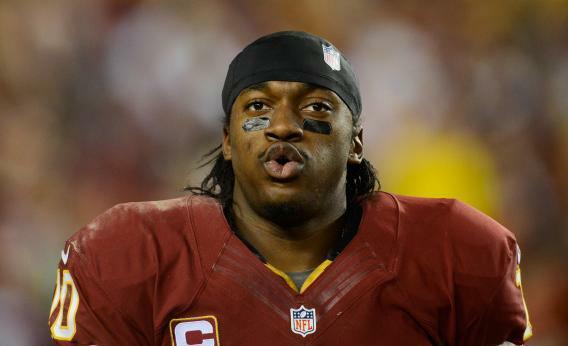 Robert Griffin III twisted his knee on the oldest clichés in sports. The Redskins’ Robert Griffin III walks off of the field injured in the fourth quarter against the Seattle Seahawks. LANDOVER, MD—After the Redskins’$2 24-14 playoff loss to the Seahawks, Washington’s players and head coach talked about the “difference between being injured and being hurt,” the importance of being there for your teammates, and how, in the words of Robert Griffin III, “you have to step up and be a man sometimes.” This is the way the NFL talks about a player who came into the game with an injured knee, hurt it again in the first quarter, and finally left the field for good after twisting that same knee again in FedExField’s chewed-up brown turf. Though Redskins head coach Mike Shanahan will surely get barraged with questions about what and when he knew about his quarterback’s injuries, this litany of post-game clichés reveals why, so long as there is pro football, there will also be players jeopardizing their health as coaches stand by and let them. In the minds of the men on the field and the ones on the sidelines wearing headsets, this was not medical malpractice. It was playoff football. Shanahan said he let Griffin return with the blessing of James Andrews, the renowned orthopedic surgeon, who was on the sideline. Andrews, however, told USA Today Sports on Saturday that he never cleared Griffin to go back into the game, because he never even examined him. Team doctors, who serve at the pleasure of the franchises that employ them, usually don’t contradict their employers. Andrews, the sports world’s surgeon to the stars, likely spoke up because he doesn’t need the Redskins to earn a living. Even so, the most-powerful orthopedist on Earth will never win an on-field debate with a star player or coach. There is no such thing as a reasoned medical checkup during an NFL game. It’s all battlefield surgery—bracing and retaping and injecting to get wounded players back on the field. In these moments, the right choice of inspiromatic sports cliché will override most any diagnosis. You’re a competitor? You don’t want to let your team down? Get on out there, franchise quarterback. These are the playoffs. Be a man. Finally, in the fourth quarter, Griffin did come out after lying on the turf for several minutes. At this point, the Redskins were losing. The season was just about over. “If you didn’t pull him out then,” Shanahan said after the game, “you should get fired.” That was the right answer to an easy question. Earlier in the game, when it was time to make a tougher call, Shanahan didn’t do it. Like RGIII said, you have to step up and be a man sometimes. Shanahan didn’t step up, and he won’t get fired for it. That’s because these are the playoffs, and these guys are competitors. Tape an aspirin to it. Let’s play.